Last week we saw Step Up 2 and this week, Step Up. Even before seeing the first movie I was disappointed with the second. The scene at the beginning and the scene at the end were good, everything in the middle, not really. The feeling I got was that the movie was made for ten year olds. Step Up was very well done. I really liked the sequence in the beginning, portraying the difference between ballet and street dancing. The scene where Tyler walks through the school does a great job of showing this kid who's in an element that's completely foreign to him. I got the sense of him walking though sort of a museum, looking at the other students, with them not seeing him. As opposed to the second movie, the first movie had a believable storyline, the character interaction was smooth and the scenes flowed naturally instead of jumping here and there. The characters didn't spontaneously change their nature like in the second movie, but when change was needed, it was gradual and believable. The behavior of the director of the school and her interaction with the main character was a lot more believable and natural then what happened in the second movie. One mistake that they made in the second movie, I believe, was having the same person being the director and the teacher. The interaction between the main character and his original friends was also a lot more believable than in Step Up 2. The relationship between them is clearly shown and their reaction to the main character's dancing is understandable and doesn't appear as selfish as it does in the second movie. The first movie was good from the beginning and until the end. The second movie, watch the beginning and the end and skip the rest. The syntax for cross-table update in MySQL is somewhat different than T-SQL. Personally, the way it's done in MySQL makes more sense. As I said before, I make my own shalach manot. This year, some people are getting what you see on the left. This is an onigiri, which, incidentally looks like hamantashen, especially with the Season black caviar in the middle. Onigiri comes from the word nigiri which means grip. Most of you should be familiar with sushi-nigiri or as it's incorrectly called in America, sushi. What Americans call rolls, is sushi-maki, sushi is sushi-nigiri and sashimi is sashimi. I'm not going to explain how to make sushi rice. I bought a Zojirushi Neuro Fuzzy rice cooker, expensive but worth it. To make onigiri, you need sushi rice, nori and stuffing. I use either black or red caviar or rolled anchovies with capers. I like to use cling wrap when shaping the rice. Take a sheet of nori. Nori sheets are not square but rectangular. Fold and tear or cut it in half so that the halves are wide. Separate each of those into three more pieces. Spread out a piece of cling wrap on a plate. Sprinkle some salt. Place rice in the middle. The amount of rice will depend on how big you want the onigiri to come out. Form the rice into a triangular shape. Make a deep indentation in the middle with your index finger and fill it with a stuffing of your choice. 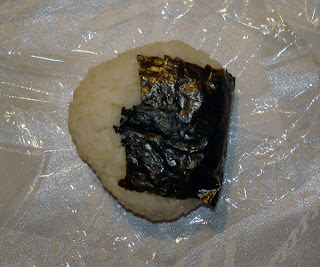 Fold the piece of nori around the onigiri with the shiny side out. Wrap the onigiri in cling wrap, add a drink and your shalach manot is done. Onigiri can also be made into a ball or any shape you like. An interesting idea is to shred some chicken breast or turkey, mix it with rice and make an onigiri out of that. This way you don't even need to add stuffing. Purim is coming up and it's time to make Shalach Manot. Shalach Manot are supposed to be ready to eat food though a lot of people seem to be confused about the meaning of the word "food". When making Shalach Manos, ask yourself, is the "food" you're planning on giving, food? Is this something that you regularly eat during the week or on Shabbat? Nuts, chocolate, grape juice, wine, hamantaschen I can live with, but all the candy, most of which is chemical garbage is where I draw the line. Most of the Shalach Manot contain tons of this bad for you, inedible garbage that will get thrown out before Pesach anyway. Stop wasting your money on this garbage because that's exactly where it's gonna end up. Another pet peeve are the baskets. You spend a lot of money on them every year and every year, in a month they end up in the garbage. I, for one, don't care if I get a sandwich in a plastic sandwich bag or in a $5 wicker or metal basket. You're not giving people birthday presents, you're giving people food. Do you like getting fifteen baskets that take up half your house or would you prefer something that can fit on your table? A couple of years ago, I decided that I will not follow the herd and even if I stand alone, I will give food, not garbage. Over the years, together with grape juice, beer and vodka I have given out baked potatoes, onigiri, salted fish and sandwiches. Last year, one of my friends gave out, in my opinion, one of the best shalach manot, an apple and a banana. It's cheap, everyone likes them and I was very happy to have something to eat while waiting for the food to be brought out at the shul's party. Another friend gave out very nicely made sushi platters, though I wouldn't recommend this for someone who's short on time and has a big list of friends. Here are some suggestions for a nice, healthy shalach manot: sandwiches, fruits, vegetables, home baked pastries, chicken legs, hot dogs, salads, etc. Want to be really cool? Get three or more pizza pies, a couple of cases of coke and bring them to shul for shacharit. What am I giving out this year? Probably sandwiches again, together with some hard to find Japanese beer, imported Chinese White tea and maybe hamantaschen. So you want watch your own videos on your Katana DLX? Here's what you need to do. First convert the file into 3GPP2 format and MPEG-4 encoding using SUPER. I found a more or less acceptable balance at 176x144 resolution, 25 frames/second and 420KBps. Create a separate video folder on your memory card and copy the files there. Go to favorites and add menu item -> tools -> file manager -> microSD. Now your videos are only a few clicks away, are in a separate folder and you don't need to wait for the thumbnails to load. Don't forget to change the video display settings to play the video in full screen. Enjoy! HTML forms have two major components, input and label. In most cases, using the label tag is not essential. There are, however, two cases where the user will be very grateful to you for not forgetting this seemingly unimportant tag, checkboxes and radio buttons. When used with a for="input_id" parameter, where input_id is the id you assigned to your input field, the user will be able to interact with the input by click on the label. The input tag can be placed inside or outside the label tag as long as the id and for parameters are the same. I find it very annoying when a developer failed to enclose the field label for a checkbox or a radio button inside a label tag, leaving me with the only option of clicking on the relatively small checkbox/radio button. I hope those of you who burden us with this inconvenience will happen to see this blog entry and correct this bad habit of yours. Good practice for everyone is to always always use label whether you "need" to or not.